Need education around marketing attribution? We have you covered. A common scenario: Your VP of Marketing asks you to pull conversion reports from all the advertising platforms you’re using (e.g., Google Ads, Facebook, your DSP, etc.). You log into these platforms and add up their conversions, only to find that this number is 5x what you're seeing internally. To better understand how these mismatches occur, take a look at this user conversion path for a razor company. We’ll refer to the user as Michael and the razor company as Rick’s Razors. Michael performs a Google Search for men’s razors. He clicks on an ad from Rick’s Razors. Michael is later retargeted by Rick’s Razors via AdRoll. The next day, Michael clicks on a Facebook ad from Rick’s Razors. This takes him to the company website where he purchases a razor. Looking at conversion reports across Google Ads, AdRoll and Facebook, Rick’s Razors sees three conversions total — but the company’s internal database confirms that there was only one conversion (Michael’s purchase). Here’s what’s going on: Google Ads, AdRoll and Facebook each have their own pixel that’s tracking Rick’s Razors conversion event. When Michael converted, each pixel triggered independently. This explains why the platforms are reporting three conversions, even though Rick's Razors knows there was only one. Why is every platform taking credit? 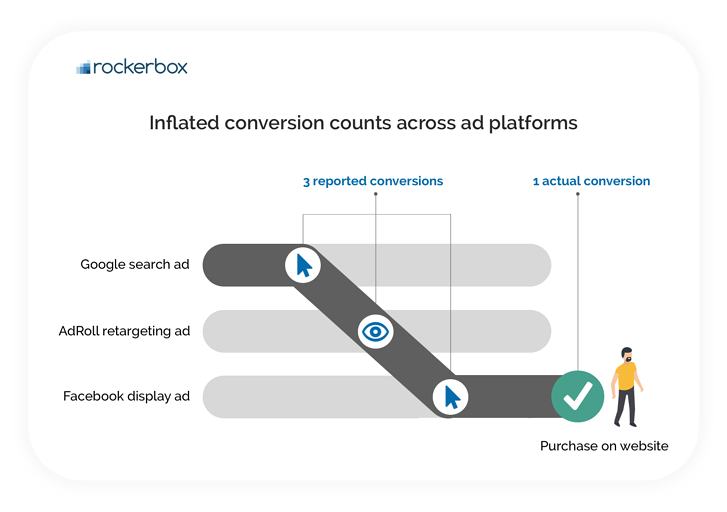 When calculating conversions, advertising platforms have no incentive to consider any other platform’s influence. Why would they put a ton of work into building out technology that could ultimately make them look bad? Think about sales associates at brick-and-mortar stores as an analogy for this. If you spend a good amount of time making a product selection at a large store, you’re probably offered assistance by at least two sales associates. After they help you, they tell you their name so you will give them credit when you check out. Sales associates have no incentive for you to mention anyone else’s name upon your checkout — this would mean less acknowledgement from their boss. They always want to take full credit for assisting you. Similarly, all advertising platforms want to count as many conversions as possible and don’t want to offer credit to any other advertising platform. This is because they want to make their CPA (cost per acquisition) for every advertiser look good. More conversions mean lower CPAs, which incentivizes advertisers to keep spending money on their platforms. Understandably, there’s skepticism in relying on conversion counts directly from third-party advertising platforms. You’ll always be over-counting if you add up the conversion counts reported by each platform. Google Analytics resolves this by providing a single source of truth for conversion counts. This is great, but you still won't know how much influence each platform had in driving a conversion. Google Analytics only provides rule-based attribution models, which lack the sophistication needed to do this. Get all recent posts to your inbox. Keep in the loop of all things marketing attribution. No spam.